Food has long since been recognized by many cultures around the world as a way of bringing people together, whether that be a family at dinner time, food festivals, date nights, the holidays or even just being neighborly to that elderly couple a few houses down. Whatever the reason, food is celebrated in some way all over the world, and depending on where about in the world you are, the food can be surprisingly different for these different occasions. 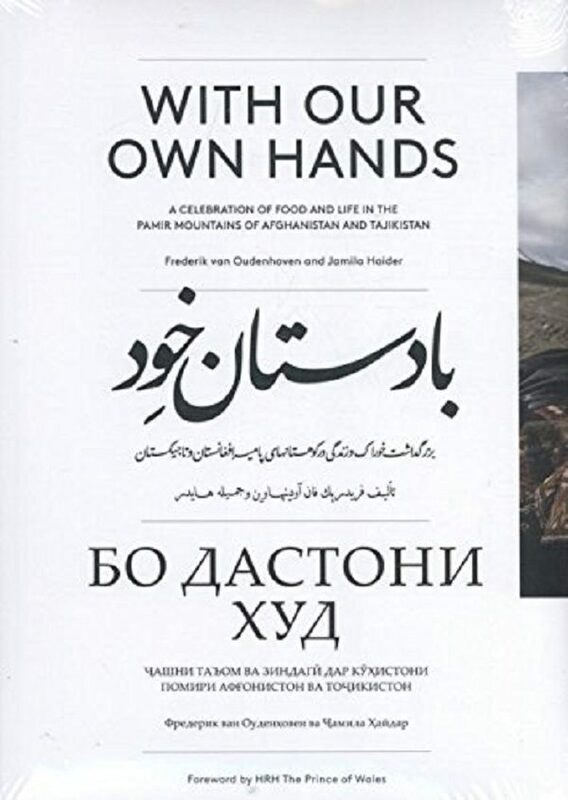 A newly released cookbook, entitled With Our Own Hands by Jamila Haider and Frederik van Oudenhoven has won the top prize at the International Gourmand Cookbook awards in June this year. This book is far more than just a typical cookbook. It is a celebration of life in one of the worlds most isolated and forgotten regions. More than just an ordinary cookbook, it provides a history of the diverse range of people in the Pamir, the agriculture and farming practices, traditional medicines still used today, religion, songs and folklore. It is a story of human survival and adaptation to mountainous environments where people have managed to cultivate rare and exotic foods and provides an interesting insight to to the bizarre knowledge held by these people. This cookbook is a culinary entry into the world of the people living in villages of Afghanistan and Tajikistan. With Our Own Hands is written in three different languages: English, Dari (Arabic script) and Tajik (in Cyrillic). The idea for the book began when the two authors first met over a bowl of Apricot Soup. It was a grandmother who asked them to write down the recipe as her language is unwritten and she wanted her children grandchildren to come to remember this recipe and pass it on for future generations. After this eye-opening encounter and introduction to unique food, the pair began working with people from the Pamir Biological Institute and Khorog State University, to enter the valleys of Afghanistan and Tajikistan to start collecting recipes. The area is incredibly remote with 97% of the terrain being mountainous with numerous different microclimates scattered about the valleys. It is due to this unique terrain and location that many different varieties of crops have adapted over millions of years to be able to survive and adapt to these harsh and unique conditions. As a result of endemism and co-evolution with nature, so came the unique language and culture. The Pamir houses a culture of sharing, generosity and hospitality that is often expressed through food. It is not uncommon to find food left on the side of the road incase a traveller may need it. One particular ingredient mentioned in the book, the mulberry, is especially important to the Pamirs because of the number of lives it saved during the Tajik civil war between 1992 and 1997. The people were cut off from the rest of Tajikistan for seven years and they didn’t even have enough money to buy flour to make bread. So they ingeniously ground up mulberries as a substitute to provide enough vitamins to see them through the tough times. An example of unique culture of the Pamir is portrayed through one of many examples such as one from the Tajik village, Baht. A cultural festival food described in With Our Own Hands is a sweet porridge made from flour and ice water traditionally made only by the men of the area. This dish is only made once a year to celebrate Nawruz, which is the Persian New Year. The flour used is made from a milled sweet red variety of wheat which is only grown in the upper areas of the valley and it is also specially grown for this very occasion. The mixture is gently heated over an open fire burning from wood a sacred juniper tree. The men of the village stay up all night to constantly stir the mixture with a spoon made of apricot wood, whilst singing songs a telling tales. Not only does this incredible cookbook contain recipes that are now being shared throughout their own culture, but also throughout the world, this book opens up the eyes of the international people to a remote and unique culture in an area on the map where some people can’t even point to. In addition to various food and cultivation practices in the area, the book also describes the importance of music and song amongst the Pamir people. Just how Westerners associate particular songs to particular holidays, such as Christmas Carols, the Pamir have songs and dance for weddings, funerals and festivals also. Unfortunately, due to lack of written language and the disconnectedness of modern people, the Pamir villagers are afraid that their historical songs and dance will soon be forgotten along with their unique food and culture around such food. When authors Jamila Haider and Frederik van Oudenhoven distributed the completed cookbook to the people of Pamir, they were excited and felt a sense of wonder that it contained a language and knowledge which before that day, had only ever been spoken. So why not try to diversify your cooking and introduce your family and friends to this newly deciphered culinary world of Afghanistan and Tajikistan by trying out some of the recipes contained within this eye-opening cookbook?